Honda (UK) has announced that Dan Linfoot and Jason O’Halloran will remain with Honda Racing, spearheading the team’s assault on the 2017 MCE British Superbike Championship aboard the all-new Honda CBR1000RR Fireblade SP2. Announced today (Sunday) at Motorcycle Live at The NEC in Birmingham, both Linfoot and O’Halloran are proven contenders in the Championship, having scored 13 podiums between them this year and O’Halloran taking his maiden MCE BSB win with the pair making the Showdown six. Linfoot’s re-signing marks his third year with Honda UK, after he has continued to show his potential and has been so close to securing his debut MCE BSB win. His help developing the new Fireblade, alongside team-mate O’Halloran, will be crucial when the team puts the all-new Fireblade through its paces at the first scheduled test in the New Year. Linfoot said: “I’m really happy to remain with Honda Racing for my third year. When I first signed in 2015 it was always in the back of my mind that I’d like to remain until the new Fireblade was available and I’m so pleased that this is now possible. Next year will be an exciting time for the team with the new CBR after eight years with the old model, and I’m excited to continue to help with the development. The new season marks the tenth year O’Halloran will be working with the manufacturer. He started his career with Honda Australia, before moving to England where he has been with Honda (UK) for seven years. The O’Show has ridden three generations of the Fireblade and has been a pivotal part in the development of the CBR in the British Championship. O’Halloran said: “I’m really pleased to be back with Honda for 2017, this year was successful for us; I finished fifth in the championship and it’s the first time I’ve completed a full Superbike season. I’m really looking forward to next year, I know we’re going to be stronger with the experience and what we have learnt from this season. 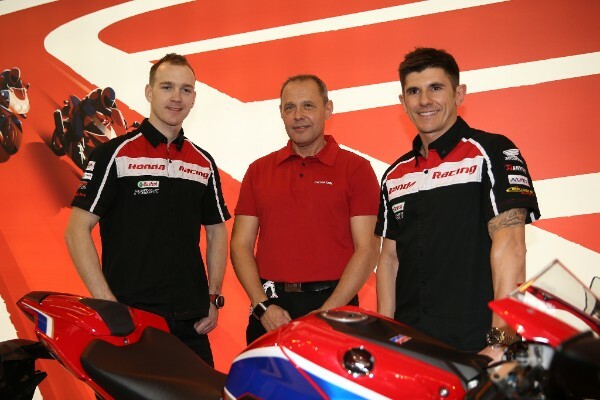 “I will have the same crew behind me, the same team and we’ll have the new Fireblade, which is exciting. I have raced the last model Fireblade since 2008, which is a long stint and have worked with Honda on the development, so it’s an exciting time with the new CBR – I can’t wait to ride it now! 2017 will be my tenth year with Honda, three with Honda Australia and seven with Honda (UK), so it’s a bit of a landmark in my career and I’m happy to continue with Honda for another year. The Honda Racing team is now awaiting delivery of the 2017 Honda CBR1000RR Fireblade SP2 and is looking forward to the opening round at Donington Park. 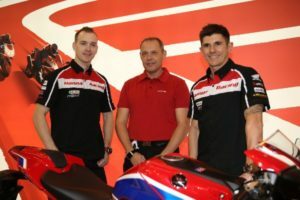 Nick Campolucci, Head of Motorcycles, Honda (UK) commented: “We are delighted to re-sign Dan and Jason for a third year in the MCE British Superbike Championship. Over the last two Superbike seasons they have both shown their potential and their help with the machine development has been crucial. “I’m looking forward to seeing them ride the new Fireblade for the first time and can’t wait to hear their feedback. Both have proved they were capable of being competitive aboard an ‘old’ machine, so once they have equal machinery and set-up to their competitors underneath them, I think they will be unstoppable. Havier Beltran, Honda Racing team manager commented: “To have both Dan and Jason with us again next year is great news and it shows they have faith in the team and also in Honda. They have worked so hard to develop the ‘old’ Fireblade and have shown they can be competitive, and it’s great to reward them with the all-new CBR for the new season. “The new year marks Jason’s tenth year with Honda and seven with Honda (UK), which is a huge milestone for both us and Jason and I don’t think any other manufacturer in the series can boast those credentials. He also took his maiden win this season – I’m sure there’ll be more to come and I’m looking forward to sharing more podiums and wins with him next year. “With Dan his potential has shone this year and he has been so close to securing his first win, I know he’ll be one to watch next year and a serious title contender. We are all now looking forward to starting our testing schedule and kicking off 2017!